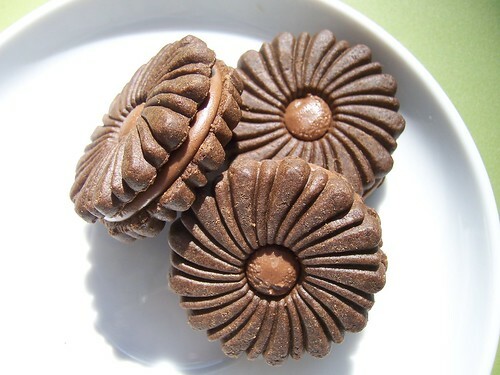 Yummy Chocolate Fudge Cookies (or should I say Fondants au Chocolat Biscuits?) by Dare. The dense and creamy fudge center is sandwiched between layers of chocolate cookies that are crunchy and not too sweet. Although, at a whopping 100 calories a piece, I’m trying to restrain myself. Oops, too late, there’s nothing but crumbs left now. Nice to know that they’re natural, at least. oh my gosh. those look incredible. MMMMM!! !